Pub is the Hub is a not-for-profit organisation which has supported hundreds of pub licensees and communities in diversifying their businesses since its inception in 2001 by HRH The Prince of Wales. It is a scheme run by voluntary advisors which tries to encourage good licensees, communities, pub owners, breweries local authorities and the private sector to work together to support and retain essential local services that can be provided by the local pub. Its purpose is not to simply rescue failing, badly run pubs. It is applicable to small rural communities of up to 1000 inhabitants. Small grants of up to £4000 may be made to help get schemes up and running. Generally it has been found that the provision of such facilities brings “new” people to the pub. The scheme will also offer advice to communities considering buying their local pub. 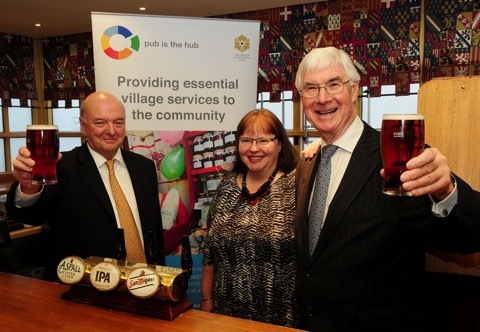 Pub is the Hub launched its rural services projects initiative in partnership with Scottish Borders Council on January 20th, where it was announced that Scottish Government would also back the scheme with a £30,000 funding boost. Over 60 pub operators, suppliers and local authority representatives attended the launch event in Lauder which began with a video announcement from Richard Lochhead, Cabinet Secretary for Rural Affairs, Food and Environment, about the funding. This initial pilot scheme in the Borders will be rolled out to other parts of Scotland during 2017.